AFRICAN AMERICAN REPORTS: If Trump picks a black VP candidate who should it be? If Trump picks a black VP candidate who should it be? Presumptive Republican presidential nominee, Donald Trump has handed off the job of searching for a vetting vice presidential candidates to Ben Carson. Now since Carson is leading the search it's highly unlikely that a black candidate will be chosen, but we now live in a world where Trump is the respective Republican nominee so anything is possible. In wondering who Carson might look at and vet I came up with a short list (very short list) of respective candidates. Let's take a look at them. Ben Carson: Highly unlikely as he has reportedly stated his does not want to be VP. He would also have trouble staying awake during meetings and would probably be a better fit as Surgeon General. 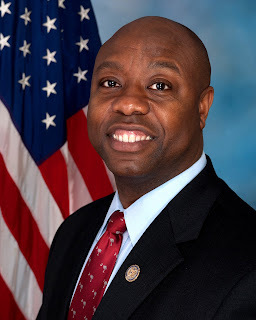 South Carolina U.S. Sen. Tim Scott Would be a great pick, intelligent, well spoken, understands the issues, and has the gift to be able to articulate his ideas to the masses. He will not be picked though because of all the aforementioned reasons. He also just has too much dignity to serve with Trump. Former Secretary of State Colin Powell: Probably over qualified for the job, but would make a great VP. He would have an excellent grasp of foreign policy and military issues. His work and statements since leaving a life of public service should give him some distance from Bush 43. Problem is he is a man of extreme honor and dignity and would never serve under Trump. The second issue is that his wife wouldn't let him serve under a Donald Trump. I can hear her saying, "You had better not!" Utah Rep. Mia Love: Supposedly a rising star in the GOP but she lacks any real experience, but this is the party that put Sarah Palin on a presidential ticket. But then again she would kill two birds with one stone. She is both black and female. Former Secretary of State Condoleezza Rice: Very qualified, has the two birds with one stone thing going, but the association and fierce loyalty to Bush 43 would be an issue. Herman Cain: No qualifications at all. He just here because he's African American and I didn't want the list to be too short. So who do you think the pick will be from this list or could there be someone I didn't mention?